Key conclusion of Anthropocene Working Group report to Geological Congress: the “Great Acceleration” in the second half of the 20th century marked the end of the Holocene and the beginning of a new geological epoch. The evidence is overwhelming: earth entered a new geological epoch in about 1950. In an official report to the International Geological Congress, the Anthropocene Working Group made that case, and proposed to move towards official adoption in the next 2-3 years. the newest epoch in the Quaternary Period. The AWG will now shift its focus to identifying a global “signal” that coincides with the change. Ten of the AWG’s members favor using plutonium fallout from nuclear tests as the signal, but there are many other possibilities. Once a signal is agreed on, they will determine a “golden spike” (properly, a “Global Boundary Stratotype Section and Point”) — an actual location in rock, sediment, or ice strata, somewhere on earth, that would physically define the onset of the new epoch. Once the AWG has agreed, it will initiate a formal approval process, which requires 60% approval by the International Commission on Stratigraphy and the Executive Committee of the International Union of Geological Sciences before the Anthropocene is added to the Geological Time Scale. Formal approval is not automatic — the ICS and the IUGS are conservative bodies and can take years to act — but there is now no doubt that the Anthropocene is real and it is here to stay. The following summary was released just before Dr. Colin Waters of the British Geological Survey began presenting the AWG’s report to the International Geological Congress on Monday, August 29. Majority AWG opinion is for assignation as an Epoch/Series. This option is preferred over either a lower rank (e.g. Age/Stage, i.e. as a subdivision of the Holocene) or a higher rank such as a Period or Era. 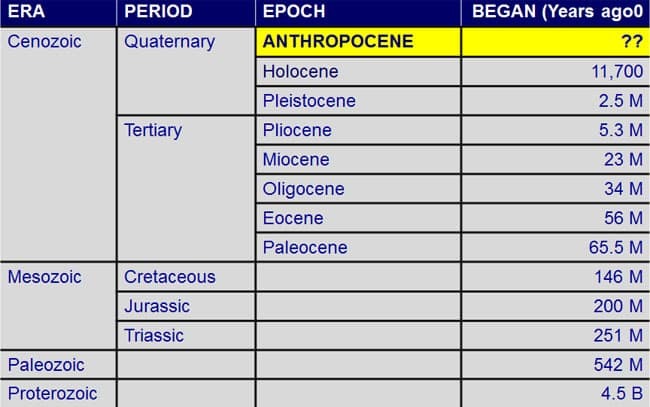 In such a step, and in common with all other geological time units, the Anthropocene would comprise both a ‘pure time’ unit (an Anthropocene Epoch) and an equivalent unit of strata (an Anthropocene Series). Human impact has left discernible traces on the stratigraphic record for thousands of years — indeed, since before the beginning of the Holocene. However, substantial and approximately globally synchronous changes to the Earth System most clearly intensified in the ‘Great Acceleration of the mid-20th century. The mid-20th century also coincides with the clearest and most distinctive array of signals imprinted upon recently deposited strata. The Anthropocene beginning might conceivably be defined by a Global Standard Stratigraphic Age (GSSA), i.e. a numerical age that can be expressed as a calendar date such as 1945. Or more, conventionally it could be defined by a Global boundary Stratotype Section and Point (GSSP), which is more colloquially a ‘golden spike’, and is a physical reference point in strata at one carefully selected place. Majority opinion on the AWG is to seek and choose a candidate GSSP, as this is the most familiar and widely accepted method of defining geological time units. This will lead to selection of sites for sampling and further analysis, to provide full descriptions of relevant signals in the strata, a process that we hope will lead to the identification of one or more suitable candidate sites for a GSSP. We would hope to complete this process over the next 2-3 years. Ian Angus is editor of the ecosocialist journal Climate & Capitalism. He is co-author, with Simon Butler, of Too Many People? Population, Immigration and the Environmental Crisis (Haymarket, 2011), and editor of the anthology The Global Fight for Climate Justice (Fernwood, 2010). His latest book is Facing the Anthropocene: Fossil Capitalism and the Crisis of the Earth System (Monthly Review Press, 2016). This article also appears in Climate and Capitalism today.